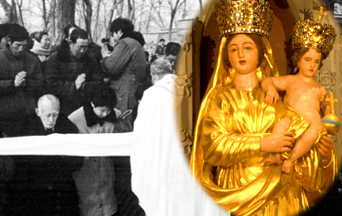 The American TFP > About Our Lady > Our Lady of Prompt Succor, Hasten to Help China! “Every one of us has a Prompt Succor story!” So began a sermon on the Feast of Our Lady of Prompt Succor, commemorating 203 years since she saved America at the Battle of New Orleans. The National Shrine of Our Lady of Prompt Succor in uptown New Orleans hosted the yearly anniversary Mass in thanksgiving the afternoon of January 8, 2018. Franciscan Fr. Albert Haase spoke in the presence of Archbishop Gregory Aymond and other bishops, priests, the Ursuline sisters and a full congregation. Years before while still a seminarian, this Chinese priest had met a priest from Louisiana who gave him prayer cards of Our Lady of Prompt Succor. Since the communist takeover of China, the Catholics had been the targets of persecution. In 1966, the Cultural Revolution began, which was especially brutal toward faithful Catholics. This priest was arrested with his bishop during what he called “the terror. ” They were forced to clean the streets for long hours every day over a period of ten years. The communists even tried to force his bishop to take a wife. When the bishop would not comply, he disappeared. At the end of each day of harassment and hard labor, the priest would take out the prayer card and beg Our Lady for the grace to hold out for just one more day. Our Lady heard his prayer, and she came with the quick help he needed to persevere and remain faithful. Our Lady is still granting quick help to her advocates, even in central China in the most dire of circumstances. As the faithful Catholic Chinese continue to face persecution and betrayal, may Our Lady of Prompt Succor hasten to grant the grace of perseverance. This entry was posted in About Our Lady, Catholic Perspective, Fighting the Culture War, News Commentary and tagged Catholic, Catholic Church, China, Chinese Catholics, Church, Cultural Revolution, faith, faithful, Our Lady, Our Lady of Prompt Succor, Our Lady of the Quick Help, persecution of Christians, perseverance, Prompt Succor, religious persecution, underground Church by Ben Broussard. Bookmark the permalink.